Q: What asset classes are covered by the PACTA tool? A: The PACTA tool covers public equity and corporate bond portfolios. Q: Are there plans to add additional asset classes, and by when? A: Currently the extension of the methodology to corporate loan portfolios of banks is under development in collaboration with 4 banks to date (Status: June 2018). This is still in the initial developing phase with no concrete timeline for a public release at this stage. Q: Who developed the tool? A: The tool was developed by the 2° Investing Imitative as part of a consortium with Frankfurt School of Finance and Management, WWF European Policy Office, WWF Germany, Kepler-Cheuvreux, Climate Bonds Initiative, SMASH, CDP and the University of Zurich. It was funded by the European Commission through the research program Horizon 2020 Sustainable Energy Investing Metrics project. It is now called the Paris Agreement Capital Transition Assessment (PACTA). Q: Which sectors are covered by the tool, and why? A: A comprehensive forward-looking scenario analysis is performed for the energy (fossil fuels), power, transport (light-heavy duty vehicles, aviation, shipping), and industrial sectors (cement, steel). 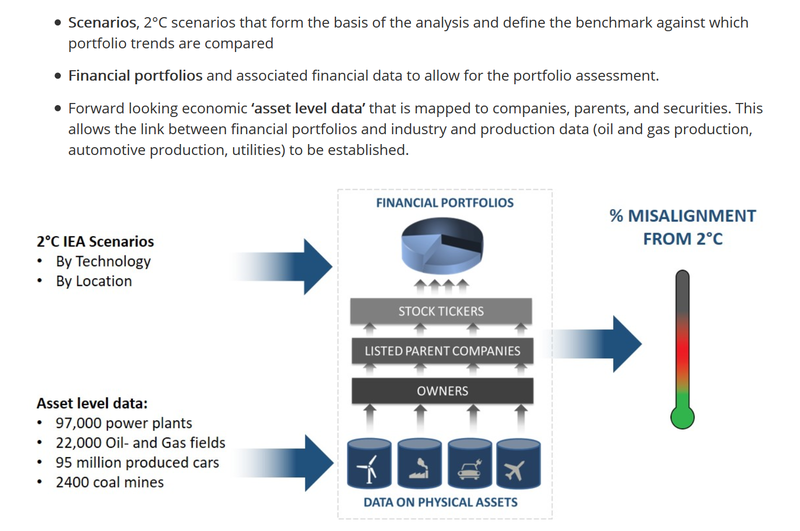 The analysis covers 70-90% of greenhouse gas emissions associated with a standard financial portfolio. Expansion to other sectors is planned in the future. Q: What geographies are covered by the tool? A: The tool has a global coverage, however the assessment is performed at the most regional level and then aggregated to create global results. The physical asset data bases have a global coverage and provide regional information such as country, state and in some cases even latitude and longitude data for each asset. The regional granularity of the scenarios differs for each sector depending on the regionality of the sector, e.g. automotive has only a global target as it is a global sector, where as the power sector has regionality down to the country level. 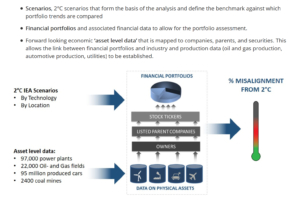 Q: How does the tool measure climate alignment for the sectors and asset classes included in the methodology? A: The first is the analysis of the holdings within the portfolio. The unique identifiers and value in the portfolio are used to identify the share of ownership of the companies or their debt within your Portfolio. The physical assets of these companies are then allocated to your portfolio to quantify the assets attributed to your portfolio. The companies within your portfolio are then aggregated to a regional level. Based on your regional ownership in the first year of the analysis, the scenario data is allocated to your portfolio to create a benchmark for your portfolio for the next five years. The assets within your portfolio are compared to these benchmarks to determine a measure of alignment to the scenarios. With this analysis, a current technology share is calculated for your equity and bond portfolios and can be compared to the market. The capacity buildout attributed to your portfolio is compared to the benchmark to show the trajectory of development. This is then used to calculate an expected exposure in 5 years, based on your current ownership. Q: Does the tool quantify financial risk? A: No. Thus far the tool does not allow a direct assessment of value at risk under a 2°C decarbonization pathway. All results are presented in production/capacity units and not in financial value. The method calculates the exposure to the transition technologies and the misalignment compared to climate scenarios. However, it does not place a value on this. Q: How can alignment results be integrated into investment practices? A: The 2° Investing Initiative’s research is provided free of charge and 2°ii does not seek any direct or indirect financial compensation for its research. 2°ii is not an investment adviser and makes no representation regarding the advisability of investing in any particular company or investment fund or other vehicle. A decision to invest in any such investment fund or other entity should not be made in reliance on any of the statements set forth on this website and the analysis results. Q: Which decarbonisation roadmaps are used by the tool? A: The SEIM assessment framework is scenario neutral, i.e. any scenario that offers a technology production/capacity breakdown of climate-relevant sectors can be used. A few sample scenarios are provided in the tool, set to be expanded over the coming months. Q: What are the limitations of the currently available roadmaps? A: There are several challenges and critic points around the available climate scenarios/roadmaps. In general, the degree Celsius number connected to climate scenarios reflect the probability of just above 50% to reach a certain global warming degree target. Thus, aligning with a 2°C scenario represents only a 50% chance and thus doesn´t necessarily lead to limiting the global warming to 2°C. Another critic is that some scenarios rely on technologies, which partially are still in a development phase and might not be ready in time to scale up at the speed required by the scenario, e.g. one criticism of the IEA 2°C scenario is that it relies on a significant portion of BECS (Bio energy with Carbon Storage) after 2050, which might not be technical feasible. On the other hand, past IEA scenarios have been quite conservative and have underestimated both energy efficiency developments and renewable deployment rates. This means that the scenarios might not be ambitious enough (compared to what is feasible) and that there is a need for more ambitious scenarios that lead to higher probabilities to limit global warming to well below 2°C, the main goals of the Paris agreement. However alternative scenarios to the IEA don´t currently cover all sectors or do not provide the same regional granularity, which is in particular beneficial for regional sectors such as the power sectors where the contribution to the decarbonization significantly differs between regions. One thing that is important to be kept in mind though, is that scenarios are not future projections, they are “just” scenarios and are based on numerous indicators and assumptions, which might not all hold true. However, scenarios present a possible way to realize a 2°C compatible transition based on the most up to date knowledge and research results. Some of these indicators rely on technology and other personal beliefs and thus can be challenged, but in the end the scenarios present the best available source for forward looking analysis. Q: What data are used as input to assess energy technology exposure? A: The data used in this analysis comes from commercial data providers who have detailed data to a physical asset level for global production and capacity using latest big data techniques, such as web-crawlers, as well as additional data analyst teams to validate and enrich the datasets. For each sector the datasets include information regarding the location, capacity or production, technology, fuel mixture and ownership of each asset. Q: How are asset data aggregated to company level? A: The asset level data is aggregated ultimately to a parent company. The data bases generally provide an ownership stake. Production is allocated to the owner on a fair share principle, in that if 30% of the production is owned, then 30% of the total capacity is allocated to that company. This is then rolled up to the ultimate parent company. The company structure is determined from Bloomberg data. The plant owner as identified in the asset level data base is matched to the company name from the Bloomberg data bases based on a process of fuzzy matching to determine the corresponding company. Depending on what level the owner is, if there are parent owners, this is rolled up until an ultimate parent company is determined and the total assets owned by this parent are aggregated. Q: To what extent does the tool take in account company investment plans? A: The data sources that we use reflect publicly available company investment plans as collated by commercial data providers. This data is collated using a mixture of methods including data mining from websites, press releases and project applications as well as company interview for validation purposes. Therefore, the data sources reflect publicly announced CAPEX plans rather than announced changes.